Since 2010, I’ve worked closely with Innovate UK – the British government’s body charged with supporting R&D – as well as piloting and launching technology solutions in my own right. Through Innovate UK, I’ve served as an assessor, consultant, mentor and monitor to over 100 companies that have been awarded grants to try something new. These include some of the largest grants every awarded by IUK and cover topics as diverse as energy efficient buildings, robots for assisted living, hyper-local media and design thinking for business. I’ve also won several awards, including an SBRI grant to develop the first internet of things platform for the schools sector (with Intel, Sciencescope and the Open University). In 2015-16 I won two awards to being the world of haptic technology and 3D virtual reality together. The outcome was a company called Touchable Universe, of which I am one of four partners. 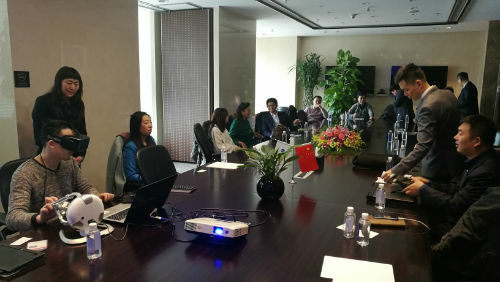 The picture shows me demonstrating the technology at the World Trade Centre in Beijing, and we are now negotiating a joint venture with a Chinese company. Whether you are seeking funding for your idea, a partner to help you make it happen, or strategic advice on an occasional basis, Stakeholder Design has all the skills and experience needed to help.